The Eclipse Aviation 500 is a small six-seat business jet aircraft that was manufactured by Eclipse Aviation. 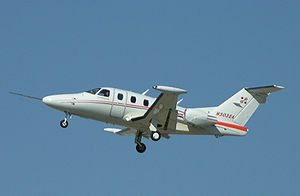 The Eclipse 500 became the first of a new class of Very Light Jets (VLJ)when the first jet was delivered in late 2006. The aircraft is powered by two lightweight Pratt & Whitney Canada PW610F turbofan engines in aft fuselage-mounted nacelles. Production of the Eclipse 500 was halted in mid-2008 due to lack of funding and the company entered Chapter 11 bankruptcy on 25 November 2008. The assets of the company were intended to be sold to EclipseJet Aviation International by court order on 23 January 2009, but that company could not complete the sale due to lack of funds and the company was forced into Chapter 7 liquidation on 24 February 2009. The Eclipse 500 is based on the Williams V-Jet II, which was designed and built by Burt Rutan's Scaled Composites in 1997 for Williams International. It was intended to be used as a testbed and demonstrator for their new FJX-2 turbofan engine. The aircraft and engine debuted at the 1997 Oshkosh Airshow. The V-Jet II was an all-composite structure with a forward-swept wing, a V-tail, each fin of which was mounted on the nacelle of one of the two engines. Williams had not intended to produce the aircraft, but it attracted a lot of attention, and Eclipse Aviation was founded in 1998 to further develop and produce the aircraft. The prototype and only V-Jet II aircraft was obtained by Eclipse Aviation along with the program, and was donated to the Experimental Aircraft Association AirVenture museum in Oshkosh, Wisconsin in 2001. Founder and former Eclipse CEO Vern Raburn was one of the first business executives at Microsoft. Subsequently, Bill Gates became a major stake-holder in the Eclipse project. The VLJ concept has been pursued by a number of manufacturers, and because the V-Jet II had been designed around one of the primary VLJ engines, Eclipse believed it was an ideal design to refine and market. The airframe was significantly redesigned as an all-metal structure with a T-tail and straight wings. The main cabin shape is essentially all that was retained from the V-Jet II. It was recognized that for an aluminum structure to be cost effective, new manufacturing techniques would have to be developed. One of the primary processes used was friction stir welding, in which the skin and underlying aluminum structure are welded together rather than riveted, as traditional for aluminum aircraft. Anti-corrosion bonding techniques were also developed. 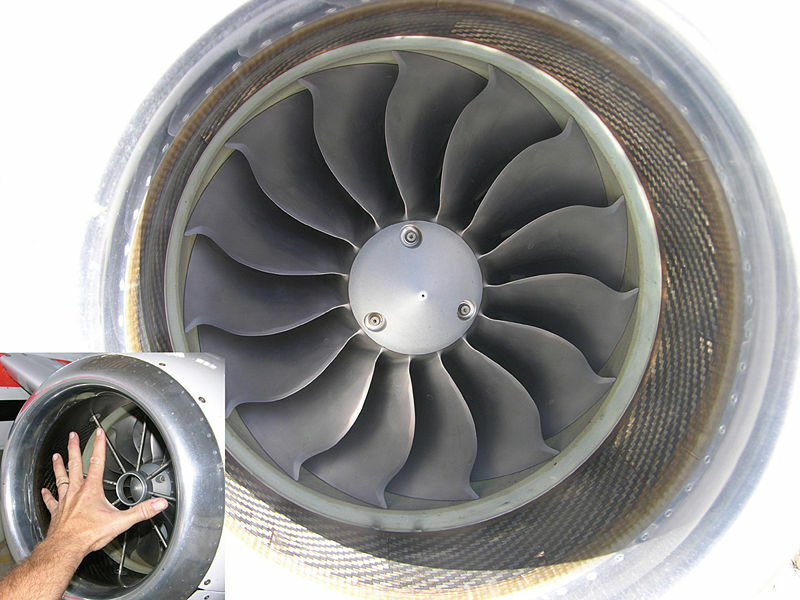 Besides materials processes, the general process of building the airframe was redesigned, with techniques taken from the automotive industry. Traditionally, aircraft structure is mounted in a jig, and the skin is riveted on to the outside of it. For the Eclipse 500, lessons were taken from composite airframe manufacturing, and the aluminum skin is first laid in a mold, and then the structure is built into it. The result is much more precise control of the aircraft's final shape, resulting in a cabin that is more robust and can be pressurized to a higher differential. In addition, the manufacturing techniques are designed so that one crew can assemble an airframe in a single shift. The complete interior is designed to be installed on a moving assembly line in 45 minutes. Originally Eclipse selected a pair of Williams International EJ-2 engines (a production variant of the FJ22/FJX-2) for the Eclipse 500, but as the aircraft's weight increased, performance was not satisfactory. Pratt & Whitney Canada agreed to participate in the project, and modified the design of their PW615 engine, designating it the Pratt & Whitney Canada PW610F. 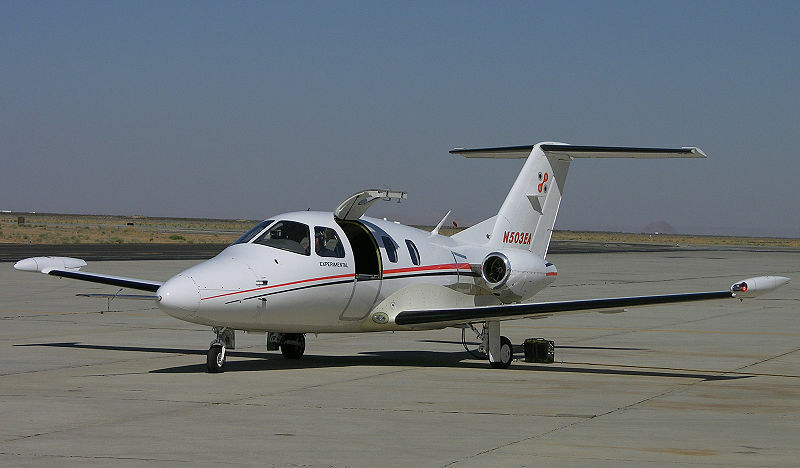 The prototype Eclipse 500 first flew with the Williams engines in 2002.The redesign to incorporate the new engines resulted in a significant delay to the development program. The first flight of the Eclipse 500 with the new engines occurred on December 31, 2004. An Eclipse press release says that its aircraft is "the quietest jet aircraft" and that it is "quieter than virtually all multi engine turboprop and piston aircraft". 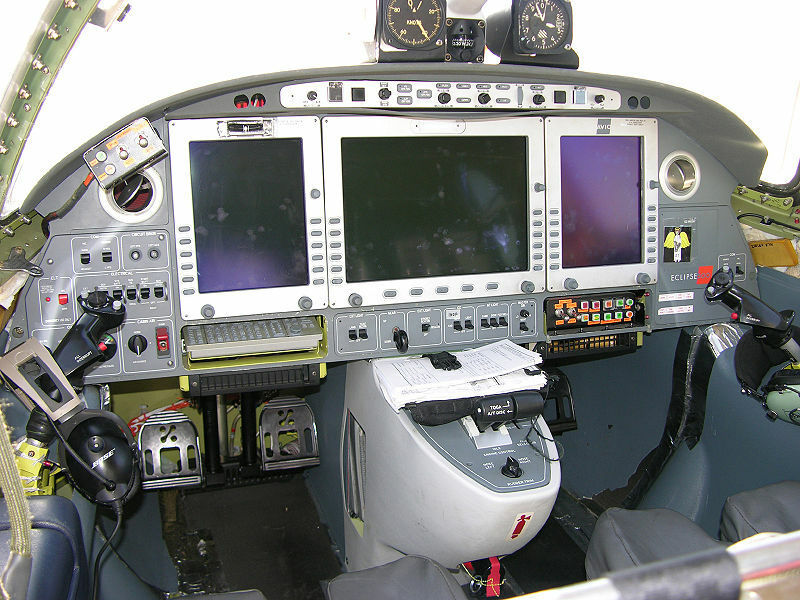 The Eclipse 500 cockpit has glass cockpit technology and an integrated avionics package. Problems with the original configuration have involved a re-design of the system. The first aircraft have the original system called Avio installed. Later aircraft have the Avio NG system in place of the original Avio. The new avionics package was certified in December 2007 and it was intended at that time that the older Avio-equipped aircraft would be retrofitted to the same standard by the end of 2008. The Eclipse 500 received provisional type certification from the FAA on 27 July 2006, shortly after the aircraft's PW610F engine was certified by the Canadian authorities. FAA Administrator Marion Blakey presented Raburn with the provisional certificate in a special ceremony at the 2006 Oshkosh Airshow. Full certification was not granted at that time because the composite wing tip fuel tanks did not meet FAA lightning strike criteria. As a result, Eclipse started testing an improved wingtip fuel tank made from aluminium. Eclipse also started ramping up production of the 500, so aircraft could be released to customers once full certification was achieved. Full type certification was eventually achieved on 30 September 2006. At that point, in addition to the five flying prototypes, 23 aircraft were in production and two had already been completed. The 500 type certificate allows the aircraft to be flown under IFR with a single pilot. Eclipse received its FAA production certificate on 26 April 2007. Serial numbers 1-11 were produced prior to the production certificate being granted. These aircraft were subject to individual FAA inspection. 500 serial number 12 and subsequent were built under production certificate No. 500. The aircraft received its certification for flight into "known icing conditions" on 25 June 2008, although this is yet to be added to the current type certificate data sheet, which is Revision 2, 15 January 2008. In June 2008 the United States Congress tasked the Office of Inspector General for the Department of Transportation with the investigation of claims by Federal Aviation Administration employees who have indicated that the certification process of the Eclipse 500 was flawed. Members of the National Air Traffic Controllers Association, which represents FAA Aircraft Certification Engineers, have filed a grievance alleging that the type certificate was improperly issued by FAA managers over a weekend and that the aircraft had outstanding safety issues at that time. The FAA stated that it stands behind its certification of the jet. Then Eclipse CEO, Vern Raburn, stated the 500 was in "complete and total conformity" and that he considered the complaint an internal FAA issue between workers and managers. that the FAA issued the 500 type certificate "without allowing FAA aircraft certification engineers and flight test pilots to properly complete their assigned certification and safety responsibilities"
The Federal Aviation Administration announced that it commenced a 30-day special review of its certification of Eclipse 500 on 11 August 2008. The review was headed by Jerry Mack, a former Boeing safety executive. The remainder of the review team is composed of personnel who were not involved in the original certification effort. The certification review team was mandated to examine aircraft safety, certification of aircraft trim, flaps, display screen blanking and stall speed issues. "Without a doubt, this special review will uncover what we already know - that the Eclipse 500 marks the safest new airplane introduction into service in 20 years, customer safety has always been a priority at Eclipse, and we look forward to this investigation dispelling any inaccuracies about the certification of this airplane for once and for all." The results of the certification review, released on 12 September 2008, indicated that the certification process was valid, but that the FAA and Eclipse Aviation "should conduct a root cause analysis" of the owner-reported problems with the aircraft's trim, trim actuator and fire-extinguisher systems. Further report recommendations addressed internal FAA processes that were not optimally handled. "This review tells us that while we made the right call in certifying this aircraft, the process we used could and should have been better coordinated. These recommendations will be invaluable as we continue certifying these new types of aircraft." A parallel investigation to the FAA panel was carried out by the US House of Representatives Aviation Subcommittee. The House Aviation Subcommittee heard testimony from the inspector general for the Transportation Department, Calvin Scovel, on 17 September 2008. He testified that FAA employees were instructed by FAA management and that a target date was set for the Eclipse 500's certification, regardless of the test flying results. "It was a calendar-driven process... with a predetermined outcome," Scovelis said. Scovelis testified that FAA Administrator Robert Sturgell recently stated that the FAA is also reviewing the production certificate that was awarded to Eclipse. US Representative Robin Hayes, (Republican, North Carolina) asked Scovel if the Eclipse jet is a safe airplane to fly. Scovel stated, "My office has no evidence that it is unsafe." Scovel added later in the proceedings that given the information that the FAA had on September 30, 2006, when the type certificate was awarded, "a reasonable decision would have been to defer the granting of the type certificate." The house aviation committee also heard on 17 September 2008 from a panel of current and former FAA employees. They stated that there was consistent pressure from FAA management to meet the stated timeline for the Eclipse 500 certification to be completed. They were told not to look more than "an inch deep" during the certification process. In the same hearings FAA managers defended their certification practices and denied many of the employees' allegations. European Aviation Safety Agency certification for private use was achieved on 21 November 2008. It requires the aircraft to be equipped differently than the FAA certification does, including the Avio NG 1.5 avionics system, a third attitude indicator and dual Mode S transponders. On 24 June 2009 EASA issued a statement suspending the Eclipse 500's type certificate, saying "The current Holder of the EASA Type Certificate EASA.IM.A.171 has been notified on 10 June 2009, of the Agency’s decision to suspend the EASA Type Certificate EASA.IM.A.171 with effect from 12 June 2009." No reason for the suspension was announced. Overall weight increase of 79 lbs with no change to full fuel payload or max useful load. Together, these measures are expected to increase the cruise speed from 360 to 370kts TAS and increase NBAA IFR range from 1055 to 1125 nm. All aircraft, including the already delivered initial deliveries, will be upgraded to this new standard. 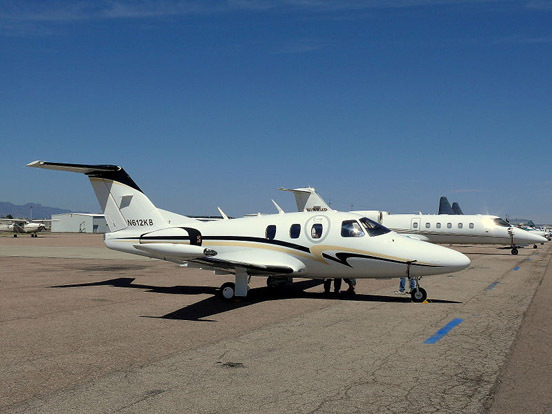 The Eclipse 500 was given an initial airframe life of 10,000 hours, 10,000 cycles or 10 years, whichever comes first. It is anticipated that this limit will be raised if the manufacturer completes additional fatigue testing. The Eclipse concept was to bring a new economy to small jet aircraft, and both cost of acquisition and ongoing operational costs were considered in the design of the plane. Eclipse has been marketing the aircraft to general aviation aircraft owners who have not previously owned a jet, so it is directly competing with high-end piston and turboprop aircraft. Eclipse's marketing efforts have focussed on the aircraft's projected low service costs and comprehensive maintenance and support program for customers. Being able to land at over 10,000 airports in the United States, Eclipse and other VLJ manufacturers hope that this would create an air taxi role for their aircraft. 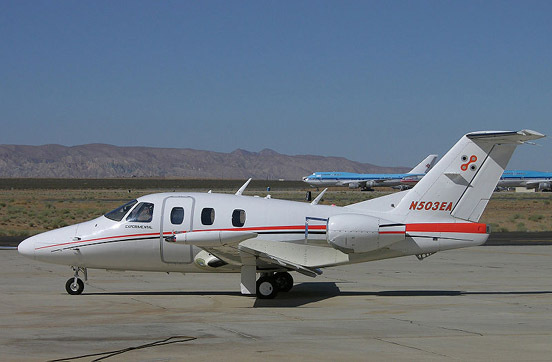 In June 2008, Eclipse claimed to have a backlog of over 2,600 total orders for its Eclipse 500. In May 2008, Eclipse announced that the price of the Eclipse 500 would transition to $2,150,000 due to a lower than projected production volume which resulted in expected efficiencies not being realized and higher production costs. At one time Eclipse offered the Jet Complete program, an aircraft management and support program.. It guaranteed private owners a fixed maintenance cost of $209 per flight hour for three years, if the aircraft was operated between 300 and 3,000 hours during that period. A similar Jet Complete Business program covered charter operators. Although Raburn told customers in late November 2006 that he anticipated delivering 10 aircraft before the end of the year, his company was only able to get a single copy of its jet delivered on December 31, 2006. The official delivery ceremony occurred on January 4, 2007, when the keys were handed over to its co-owners, David Crowe, an owner-pilot and the shared-jet cooperative group, Jet Alliance. At the time of bankruptcy filing on 25 November 2008 Eclipse had delivered 259 EA500s. Serial number 260 had been paid for on the morning of the filing and in advance of the filing, but the company refused to release the aircraft to its owner. The bankruptcy judge noted the fate of this particular aircraft and ordered that the company maintain it and insure it until its final disposition is decided. In the final judgment the aircraft was ordered released within five days of the closing of the sale of the company, but the sale was not completed and the fate of 260 has not been determined. Eclipse halted production of the E-500 in October 2008 at serial number 267, although serial number 266 was completed much earlier in the year. The company indicated that it lacked the funds to continue production or to refund customer deposits for the EA500 and 400 that were owed and are the subject of outstanding lawsuits. On 20 November 2008 Eclipse announced a reduction in company hours for maintenance scheduling, technical services and customer care. Aviation Week & Space Technology noted that "regardless of technical support, several critical spare parts are no longer in inventory because many vendors have stopped shipping spares to Eclipse until they receive payment for past due bills. And they won't ship more spares to Eclipse except on a COD basis. Notably, only a few vendors will sell parts directly to customers because of previous exclusive supply contracts with Eclipse." In January 2009 all Eclipse factory support facilities were closed. In response at least one group of ex-employees set up a maintenance and support facility to assist the owners of the 259 aircraft already delivered by that point. DayJet was the Eclipse 500's largest customer, as at one time it had 1400 aircraft on order for use in the air taxi role. Aviation analysts were doubtful whether the company's aggressive sales and production targets were feasible. On 6 May 2008 DayJet announced that it had scaled back its operations, laying off 100-160 employees in all segments of the company and selling or leasing out 16 of its fleet of 28 Eclipse 500s. DayJet founder and CEO Ed Iacobucci indicated at that time that the company needed USD$40M to reach profitability, but that the current economic climate did not permit the company to raise that amount. Iacobucci stated that the company proved that the operational concept is sound, but that the DayJet fleet of 28 Eclipse 500s needed to be quickly expanded to 50 aircraft to attain profitability. With 1400 500s on order out of a claimed order book of about 2500 aircraft DayJet represented 58% of all Eclipses that had been ordered. Eclipse Aviation announced in October 2008 that they are acting as "the exclusive broker" in the sale of the DayJet aircraft and advertised the entire fleet of 28 aircraft for sale. Canadian light aircraft fractional aircraft company OurPlane bid on the entire DayJet fleet of aircraft, offering more than "$500,000 each but less than $1.5 million" each. OurPlane operates a fleet of Cirrus SR22 aircraft and one current Eclipse 500. Customer reception of the aircraft has been mixed. On June 12, 2008, the Federal Aviation Administration issued Emergency Airworthiness Directive AD 2008-13-51 grounding all Eclipse 500s, following an incident at Chicago's Midway Airport. According to a National Transportation Safety Board investigation, "the airplane was trying to land at Midway when the crew encountered a sudden shift in headwinds, which the pilot sought to counter by increasing power, the standard method. But when the pilot tried to cut power a few seconds later, as the airplane touched down, the engines began accelerating to maximum power." The pilots overshot, gained altitude and shut down one engine, eventually landing without injury or damage except blown out tires. Reports published on June 16, 2008 indicated that all 500s were compliant with the AD and cleared to fly again within one day of the AD being issued. The company indicated that the final solution to this problem was a software change to increase the throttle range and prevent an out-of-range condition. The Eclipse 500 is supported by an active aircraft type club, the Eclipse Owners Club. The club was originally formed by Eclipse Aviation in the summer of 2006 and funded by the company until November 2007. The club is now an independent body governed by a five member board and has dues of USD$125 per year. For people who are not Eclipse owners or position holders the club has an "enthusiast" membership level which is free of charge, but provides only limited access to the club forums.